So what do you do when you make an 8×8 inch pumpkin cake and you finish it off in less than 30 minutes after it came of the oven? You make a double recipe right away! If you don’t, then you are out of your mind and you should call me to help talk some sense into you. Okay, let me give you a bit of a background story here. I have been thinking for a few weeks now that I don’t make enough pumpkin recipes for my family. Apart from this Melt-in-your-Mouth Pumpkin Custard that is out of this world and that I make at least 7-8 times throughout the year (not only during fall), I can’t think of another pumpkin recipe I make on a regular basis for my family. What?! Yup, pumpkin doesn’t come very often into our house. I am not a pumpkin fan, so I avoid trying new recipes as I don’t want to scare my family away (and myself even more) from pumpkin by giving them a bad-tasting recipe. Also, since my son can’t have gluten or dairy foods, is a bit harder to find delicious recipes that he can eat. So I set on a quest to make the second best pumpkin recipe (the first one is the Pumpkin Custard I mentioned above as nothing can dethrone it from 1st place). I remembered that Alana from Elana’s pantry has delicious recipes, so I checked a few of them out. I found a few that looked good and then I settled on this one. I made a few changes to it and this amazing pumpkin cake came to be. 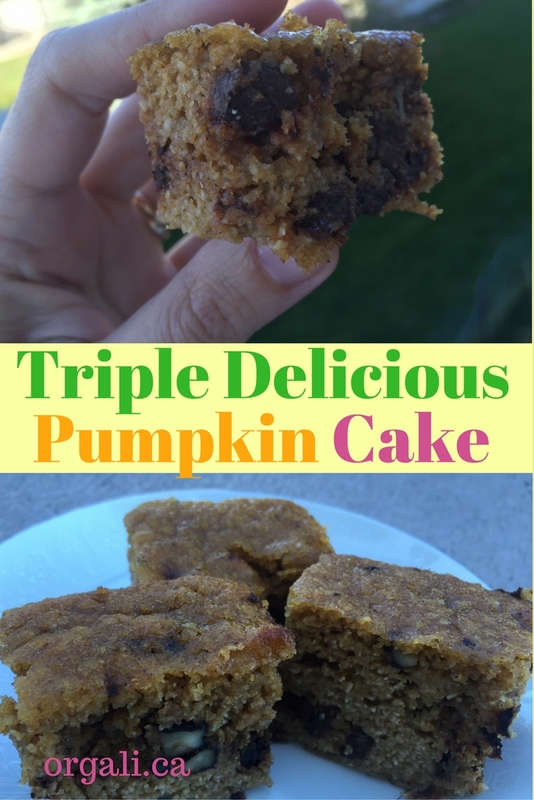 I am sure you have been wondering why the pumpkin cake is triple delicious. Because it has a trio of delicious ingredients that together make a symphony of flavours: walnuts, raisins, and chocolate chips. Together, these three make this moist, sweet, and slightly fudgy cake that made me and my son finish it in less than half an hour. I hope you didn’t think I ate the whole cake by myself! But please don’t worry, the rest of my family didn’t go without cake. I made a double recipe right away and they all enjoyed the delicious pumpkin cake. Please make this cake ASAP! If you love pumpkin and even if you don’t, you will fall in love with this cake. It would also be a great dessert for your Thanksgiving dinner. Beat the eggs. Add the pumpkin and maple syrup and mix. Add one at a time the almond flour, pumpkin spice, baking soda, and sea salt. Add the chocolate chips, raisins, and walnuts. I broke the walnuts into small pieces using my fingers. Pour the mixture in a 8x8 inch oven-proof greased dish. I used coconut oil to grease it. Bake for 32-35 minutes until the surface is lightly browned or when a toothpick comes out clean. Allow it to cool a bit and enjoy! I would like to say that it lasts in the fridge for up to 3 days but I am sure it won’t as you will eat it ALL. What is your favourite pumpkin recipe? I would love if you would share it below as I need to add more delicious and nutritious pumpkin recipes to my regular rotation. P.S. I am organizing a Workshop on Picky Eating in Calgary on September the 28th. I you struggle with one (or more) picky eaters and you need help ASAP, I would love to see you there. YUM!! my mouth is watering! I have to try this! I hope you will, Mary. It’s also very easy to make. Fiona, I am not a fan of pumpkin, but this recipe is truly delicious. Yum! This looks so good! I love all the good stuff mixed in!!! Walnuts, raisins, and chocolate chips take the cake to a whole new level. Yum!